If someone asked you to pick between Boots and Superdrug, chances are you’d know straight away which one is your favourite. Until I went cruelty free I would have said Boots. I still enjoy wandering the aisles and browsing the many, many types of products they sell, a hobby which is dangerous for the bank balance. The other good thing about Superdrug’s own-brand products is that they’re all reasonably priced. As a result, I’ve been buying my everyday products there more and more. I love a little luxury every now and then, but I also appreciate getting good value for money, and the duo below provide just that. My winter bodycare is already sorted. This is a repurchase — always a sign a product works well. The scrub strikes the ideal balance between being gentle and being gritty. Make no mistake, it sloughs off dead skin and corrects botched gradual tan with the best of them, but it won’t leave your skin rubbed raw. 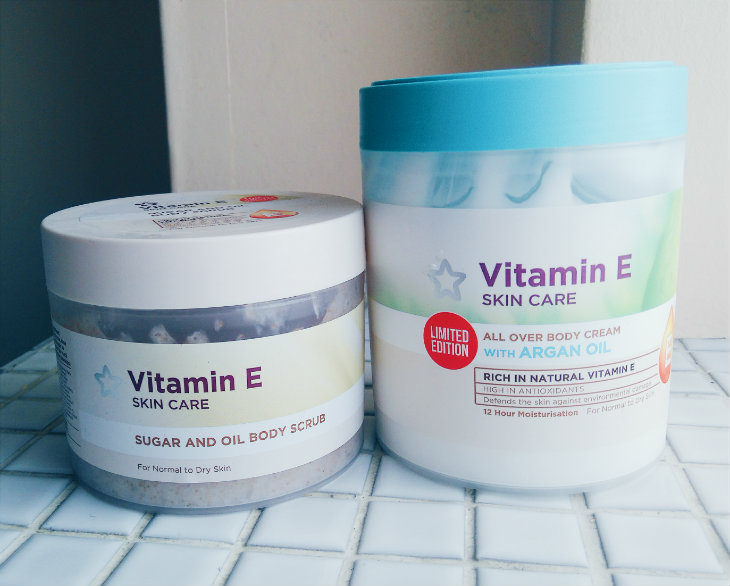 I’ve been using the Vitamin E scrub all summer and this is only my second tub, so you get your money’s worth. The range is often on offer, too. I picked up the regular version of this, but the woman behind the counter recommended the argan oil version for extra hydration. I can see why it’s been so popular because it’s got the perfect texture — thick enough to feel luxurious, but not so thick that it feels gloopy. The scent is pleasant and not overpowering, and the cream itself is incredibly moisturising, which is the most important thing. I’m so lazy when it comes to body lotion but I’ve been using this every day without fail. It’s dreamy, especially when you apply it after using the scrub. I believe the argan oil very is limited edition, so go out and get a tub before they’re all gone. Have you tried any of Superdrug’s own-brand products? Do you remember to use body lotion or are you lazy like me? Let me know in the comments.